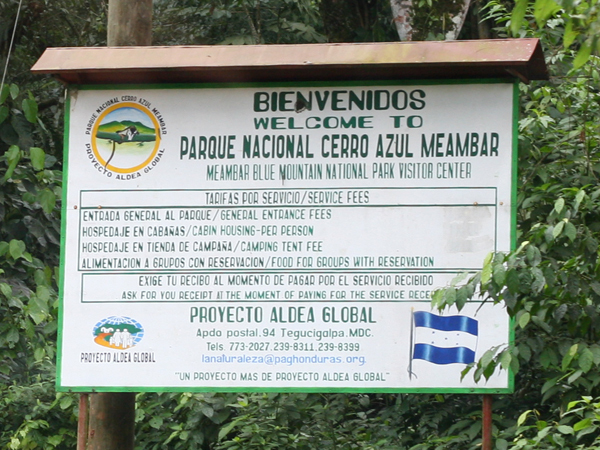 For the second morning of the Mesoamerican Birding Festival I signed up for the trip up to Cerro Azul Meambar National Park, a 478 square kilometer forested preserve that rises from and overlooks the Lake Yojoa basin. I had been torn between signing up for Cerro Azul or for the cloud forest at Santa Barbara National Park but the heavy rains of the previous day had scuttled the Santa Barbara trip so my destination decision was made for me. 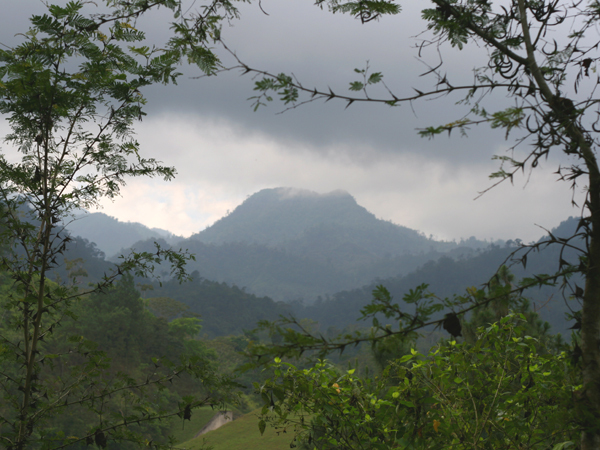 And what a destination is Cerro Azul Meamber National Park! The long dirt entrance road, which dips down into a valley and goes past a small lake created by a large earthen dam before it ascends through several switchbacks to the park proper, has great birding along its entire length and would have almost been worth the trip by itself. The park has a couple of nice trails to choose from, great birds, and very active hummingbird feeders. But I am getting ahead of myself here: I should go back and start at the beginning. When my traveling alarm clock went off at 5:30 AM I was already awake and ready to go birding. Not because the beds at Hotel Las Glorias were uncomfortable or anything but because I was so excited to be heading up in elevation and couldn’t wait to see what creatures of the avian persuasion awaited our group of intrepid birders. After bolting down my breakfast and nearly scalding my mouth with the hot and plentiful coffee I was ready to go. We all climbed aboard the coaster and headed out, being driven by the unflappable Orlando, possibly the greatest driver in Honduras, if not all of Central America (this would become rather important later). En route to the entrance road we saw many of the common roadside birds and one life bird for me, a Crested Caracara which was perched on a power pylon. Once we reached the entrance road we rather quickly took a stop because hordes of birds were in sight and, considering the goal of the trip was to see birds, we had to get out and take a look. Orlando drove the coaster down the hill to patiently await us birders while we exclaimed over everything from Red-lored Parrots to a brilliant male Painted Bunting. A ginormous flock of Rose-breasted Grosbeaks in every possible plumage was another highlight of our walk downhill, as was a pair of Plumbeous Kites and a Masked Tityra. Some trees held no birds, others held one or two, and some were loaded with hordes of wintering warblers. Once again, I experienced sensory overload and nearly hurt myself trying to look in ten directions at once! Once we caught up to the bus we had to make an attempt to tape out a Prevost’s Ground Sparrow from a rather overgrown field where they had been reported recently. We had no luck in our attempt which was cut short by a very loud bulldozer which chose that moment to drive by the sparrow spot. But merely missing a rather reclusive sparrow could not put a damper on our enthusiasm: we were in a birder’s paradise after all! It wasn’t much farther down the road that we started hearing a Little Tinamou, but we would not see one. Talk about frustrating. They were the aural equivalent of a Will-o-the-wisp, always sounding somewhat close but never in sight. 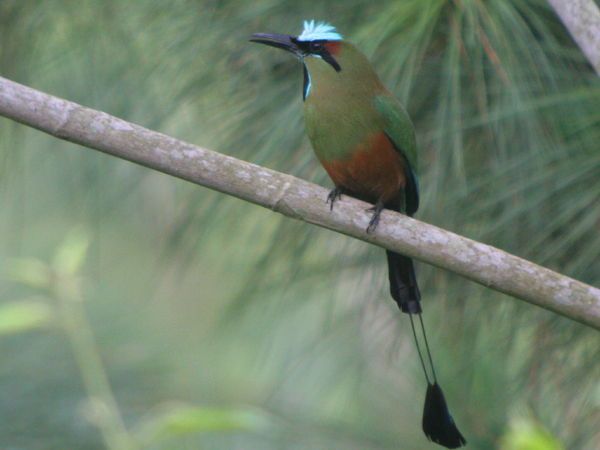 Fortunately, I managed to avoid the temptation of plunging off the road into the jungle after them…but I was unable to resist taking shots of both the Blue-crowned and Turquoise-browed Motmots we encountered shortly thereafter! We also had a Ferruginous Pygmy-Owl that was perched high overhead on a bare branch and I unwittingly provided much entertainment to some of my fellow birders by virtually pole-dancing on my tripod in order to get it elevated to the point where I could actually focus my Swarovski digiscoping rig on the bird. The worst part was the pictures were practically worthless unless you really like owl butts shot from below! We then piled back in the coaster for a short ride until more bird activity high overhead was detected and we all piled out again only to see a flock of White-collared Swifts circling way up high along with an incongruous Swallow-tailed Kite. A little farther down the road a Blue-black Grosbeak and Crimson-rumped Tanagers (which I later learned had been split into two species; the one I saw was Passerini’s Tanager) attracted our attention and a lucky few (I was not one of them) were really fortunate as they saw a pair of Highland Guan take off through the forest! 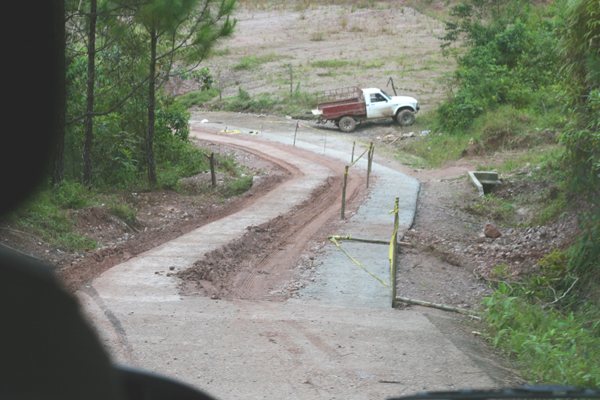 When we finally all got back in the coaster and headed up the steepest part of the road, which was amazingly angled for a vehicle as large as our coaster to be going up, even though a sidewalk-wide strip of concrete provided traction for the right tires. About halfway up the very steepest section we were dismayed to see a road crew out putting down another strip of cement to provide traction for vehicles’ left tires. It wasn’t the work that dismayed us but the fact that the bus was forced to give up the one strip of concrete it already had and hug the right shoulder, the extremely muddy right shoulder next to the very big drop off that is, and chug along uphill with the rear tires struggling for traction. We almost made it past the construction due to masterful driving by the aforementioned Orlando before forward momentum was lost and the tires started to spin. The road crew was begged to give us a push and while most passengers moved to the back of the bus to provide more weight to give traction. Julie and I, on the other hand, hopped off the coaster, Julie because she was sure the bus was about to plunge off the cliff taking everyone with it and me because I did not think it was possible to push such a large vehicle uphill and I figured if we were going to be stuck for awhile anyway I might as well get out and look for birds. Fortunately, we were both wrong and unfortunately once the bus got moving Orlando was unwilling to lose precious forward momentum so arduously gained so Julie and I had to hoof it uphill and rejoin the coaster on a more level spot. When we arrived at the park proper we were all relieved, though the small village we had driven through just before the park had provided entertainment when all of the children yelled “Orlando!” as we drove through (I told you he was the best driver in Central America). I think the kids knew it had to be him because no one else could have gotten such a large vehicle up through such challenging conditions. The rest of our visit to the actual park will have to wait until the next post though I will provide one shot of what awaited us in the trees over the parking lot: my first trogon! What a bird! And so cooperative! 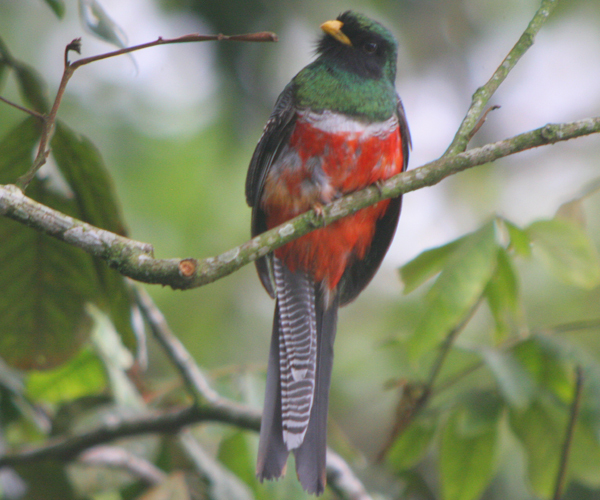 Collared Trogon immediately became my favorite trogon species, and even after seeing two more species during the Honduras trip it was not displaced. 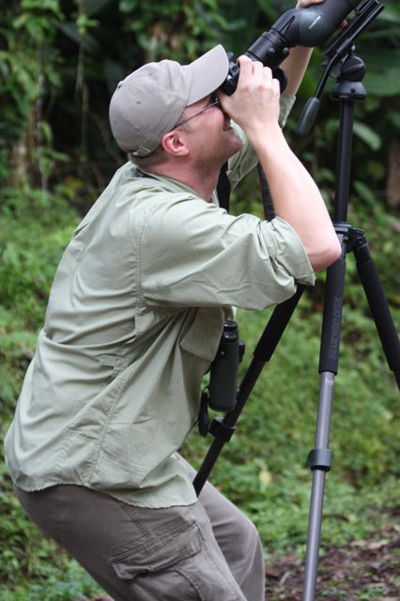 Come back soon for part two of the Cerro Azul Meambar National Park birding adventure! Check your email for your hot new profile pic. That sounds really awesome – you have me hooked as you recount your trip. 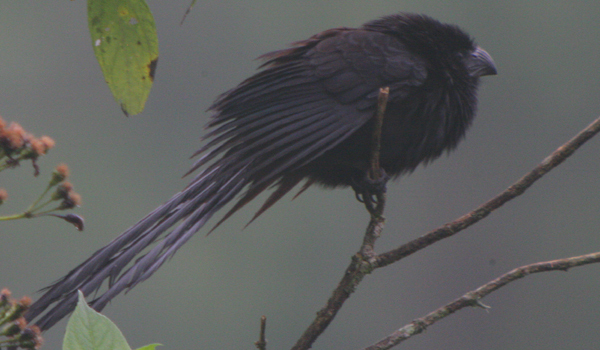 Plumbeous Kite is not very easy to see in Honduras, congratulations on the sighting. Highland Guan is hard to see. Dipping on it makes two of us. Every birder who has gone to these sort of places has at least one story about a harrowing driving experience that makes for a thankful, good laugh in retrospect.